Here’s another cheering little video, although unfortunately it is from the Grauniad so you will have to hold your nose. It’s of Jeremy Corbyn at the rally in Broxtowe really putting the boot into the Labour defectors. He says what they really stand for: austerity and protecting the rich against the poor. He then goes on to talk about the increase in the Labour vote at the 2017 election, which was the biggest in any election since 1945. That was because the party campaigned, the community campaigned, people got together and started talking about politics, about life, about how our society could be run. It wasn’t the old transactional politics, but the new involved politics of the future. And what’s different about Labour is the membership is three times bigger, but it’s also much more involved, much more involved with the communities, and it is those communities and those members that will be making the policies that will write the manifestos for the future. Absolutely. And it’s because Labour’s policies are inspiring, and that the party is empowering people, that Red Tories like Berger and Leslie have joined true blue Tories like Soubry. And they and the media are attacking Corbyn and smearing him as an anti-Semite, because they have nothing else to use. Their policies are old, outmoded and massively unpopular. It’s time they, and the Tories themselves, were gone. A university student who was born without a forearm due to a rare genetic condition has created a robotic prosthetic arm using Lego. David Aguilar, who built three other models before his current one, said “I wanted to see myself in the mirror like I see other guys with two hands. Is this his first bionic arm? No. David, 19, began experimenting with artificial limbs as a child. he said his father bought him a lego Titanic set aged five and the colourful bricks became one of his favourite toys. David made his first artificial arm, albeit with limited movement, aged nine. ‘As a child I was very nervous to be in front of other guys, because I was different, but that didn’t stop me believing in my dreams,’ he said. David uses Lego pieces given to him by a friend. Last year he built a red-and-yellow, fully functional robotic arm, it’s fitted with an electric motor and he can bend it at the joint and flex a grabber attached at the end. His latest prototypes are marked MK followed by the number – a tribute to comic book superhero Iron Man and his MK armour suits. Could this spawn an army of Iron men and Iron Women? The rookie inventor from the small principality of Andorra is studying bioengineering at the Universität Internacional de Catalunya in Spain. 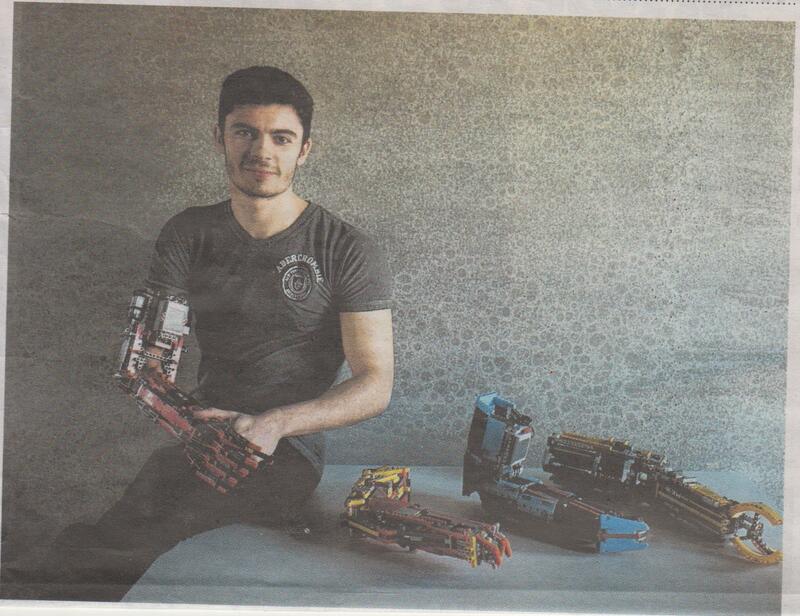 His post-graduation dream is to design affordable robotic limbs for those in need. He said “I would try to give them a prosthetic arm, even if it’s for free, to make them feel like a normal person, because what is normal, right”. There’s a lot of research going on into artificial limbs, some of it very inspiring. The robotics unit at the University of the West of England has formed a private company to build artificial hands for children. They’ve produced one with the consent of Hollywood shaped like the hand of the Marvel superhero, Iron Man. I think they were also planning to produce one based on C3PO in collaboration with Disney, if I recall correctly. Aguilar’s clearly a very skilled engineer, and his own experience of disability undoubtedly gives him real, personal insight into what disabled people need in artificial limbs and how they can be best designed for them. I wonder what his work will be like after he’s graduated and, hopefully, begun working on them at a higher level. It should be really good. In the meantime, I’d really have loved to be able to make a proper, working robotic arm out of Lego, Meccano or any other construction kit when I was child as well as knowing how he does it now.